If the Americans have popsicles, Malaysians have potong then the Filipinos have the ice candy. Ice candy are frozen treats made out of fruits, beans or even root crops such as purple yam placed in small plastic bags. Popular during summer you can see a lot of kids neighbourhood houses sells this (similar to the lemonade in America) to earn extra money. There are a lot of flavours for this frozen wonder and the most popular ones are monggo (green or red bean), buko (coconut) and melon. Usually it is consumed by cutting the end of the plastic and sipping all of that goodness inside. I am sure this will be hard to make for those who don’t have the special plastic bags which are only sold in the Philippines but you can still refer to the recipe below and use it in your popsicle moulds. For me I will stick to the plastic bags as a friend of mine bought some for me when he went back for a vacation in the Philippines. I did grow up on ice cream potong and this is very similar. My favourite flavour is the red bean too although corn came a close second. Really interesting – this is just totally new to me. I love learning new things! The flavor sounds so intriguing. Thanks. I’ve never heard of nor seen these before, but they’re awesome! Definitely bookmark to try. Very cool. I could use about three dozen right now. Nice find! this will help readers in US. I used to eat this type of ice during my school days! 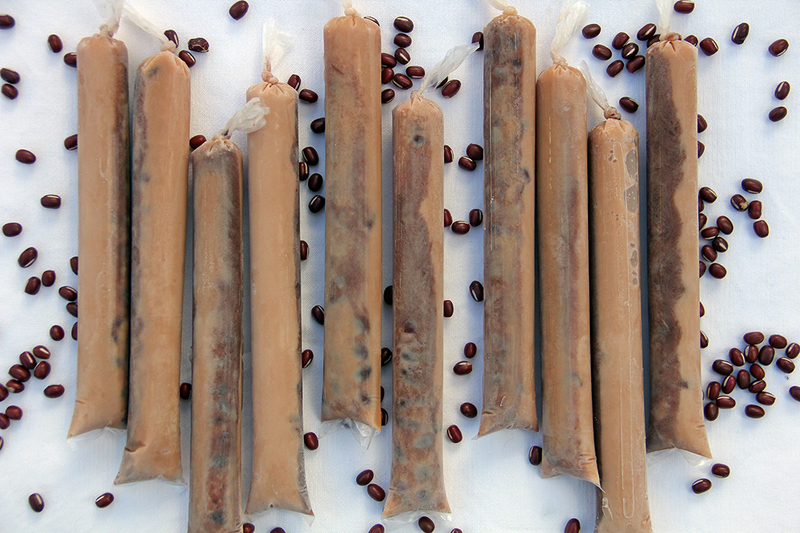 Not only do we have ice candy in the states, but we don’t use beans for sweets. I love the Japanese use of red beans and black beans in dessert so I know I would love these ice candies. I see that someone found a link to buy the wrappers on-line. Yay! Thanks for sharing this traditional recipe! I love it! this looks so interesting, I want to try it! Definitely will be added to our summer treat list. I have forgotten about these treats. Thanks! halo-halo ice candy at work cost 8 pesos.. 🙁 sooo expensive. haven’t tried red mongo though..
What an easy way to make a delicious treat ! I sell Ice Candy bags. Ask ko lang po yun po bang nabibili na red munggo sa grocery un nasa bote kailangan pabang lutuin un?